Maybe... see prerequisites at top of registration page. The WOWS is Not-For-Profit! Entry fees cover the costs associated with maintaining the organization and the out of pocket expenses of the scorers that make each event possible. A fully transparent event budget is available for each event, showing the costs and usage for every dollar of entry fees. CASH MONEY. Part of the entry fee goes to the cash prize pool. Squirrel, as title sponsor, donates cash to each event. WOWS does not accept partial discount certificates, so you will never win a “prize” like 25% off some piece of gear. WOWS only accepts cash and 100% discount certificates from sponsors, and all cash is passed directly to pilots. How is this different from the PPC? The WOWS is a Four-Cross racing format. 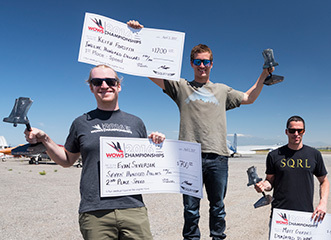 You race against other pilots in the air with you, and half of each heat advances to the next round. You do not need to listen to any Flysight beeps in flight. You can see the pilots that you are racing against, and usually know the results of your heat before you land. To train for the WOWS, solo jumps are not recommended – it is better to train the race format together with your friends. The WOWS aims to increase pilot skill by encouraging you to practice relevant skills together with other pilots. I'm not qualified yet, but I want to be. What should I do? Skydive a lot until you have enough experience to jump a high performance wingsuit (in the future multiple classes will emerge, but for now there is only the "Open" class). Practice with your high performance wingsuit together with other high-level pilots. Learn to fly fast safely, in formation with other expert pilots. Most pilots who are qualified to race in the WOWS now have close to 1000 skydives, with at least 500 of them being in wingsuits. What do I need to compete in an event? Flysight, AAD, Visual Altimeter, Helmet. How do I organize a race at my DZ? WOWS is an open-source race format designed to be easily replicated by organizers who wish to host an event. The series in non-profit and there is not meant to be a financial incentive to organizing races. WOWS events bring wingsuits to a dropzone and aim to increase the level of piloting, awareness, and safety of the wingsuit pilots who participate; if that sounds like something you would like to be a part of, then contact us with information about yourself and your background. Who the hell is organizing this shitshow? WOWS is a Not-For-Profit organization that relies on volunteers for the organization and scoring of each event. If you would like to help organize an event, email team@wingsuitrace.org. Squirrel is a title sponsor.